Forget 2017 – it was garbage. Yes, it gave us huge leaps forward in LGBT political representation, with openly transgender and lesbian politicians across the US smashing through barriers. But it was also a year in which President Donald Trump’s administration attempt to ban trans people from the military and make it legal for business to discriminate against LGBT people. And, of course, 2017 saw more trans people murdered in the US than any other year on record. And thanks to pop star Hayley Kiyoko, we have a name for this new beginning. The Disney-star-turned-queer-icon broke the internet last year with an Instagram post in which she kissed Chanel Celaya, who played ‘Headphones Girl’ in her Gravel To Tempo video. The singer, dubbed Lesbian Jesus by some fans, also released the video for her lesbian love song Feelings, in which she dances, sings and flirts with a woman on a deserted street. And now, ahead of her first album – Expectations – she’s gone one better, launching a hashtag to make this year the gayest ever. “It’s our year, it’s our time,” she told fans. 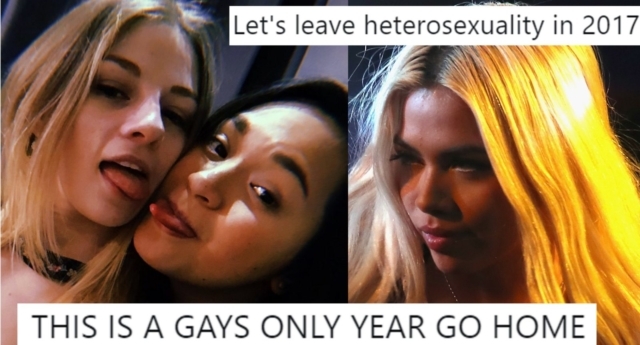 Fans embraced the concept, tweeting their overwhelming support for #20GayTeen. One wrote that the “last sentence i heard in 2017 at 11:59/first thing i did in 2018 was “girls like girls” a Concept @HayleyKiyoko #20gayteen 🏳️‍🌈”. Another said: “We are finally in #20Gayteen I’m excited and gay”. And for some, it was more special than others. One lucky user wrote that it was the “last year of being fianceés. She added: “next year we’ll be wives 💍👩‍❤️‍💋‍👩 #2018 #20GAYTEEN”. Another person said: “So happy we finally arrived in #20GAYTEEN @HayleyKiyoko”. One person suggested a formal name change, writing: “petition to rename 2018 to #20gayteen bc it’ll be our gayest year yet”. And users leant their backing to this idea, with one person saying: “Make 2018 gayer than ever 🦄🌈”. “Here’s to being a teenager for #20GAYTEEN”, another user wrote. One person said: “hello #20gayteen i have arrived and i’m ready for the year”. And another wrote: “Let’s leave heterosexuality in 2017 where it belongs. #20Gayteen”. In a similar vein, another person said: “THIS IS A GAYS ONLY YEAR GO HOME #20GAYTEEN #expectations2018”. And one more user, referencing TV show The Bold Type, which last year featured a Muslim lesbian and a black woman falling for each other. “Thinking about how 2017 has been such a great year for queer women of colour,” they wrote.